A couple of miles from Purleigh brought me to the Chelmsford to Maldon road, and as I crossed it the landscape changed completely - now it was the Essex I remembered from bike rides last year, rich and green, hedgerows, pretty villages and the like. It was all slightly down hill and I soon came to Woodham Walter. Locked, no keyholder. This was my one disappointment of the day. It is supposed to be kept open, so I could only put the lack of a keyholder down to someone forgetting to open it today. 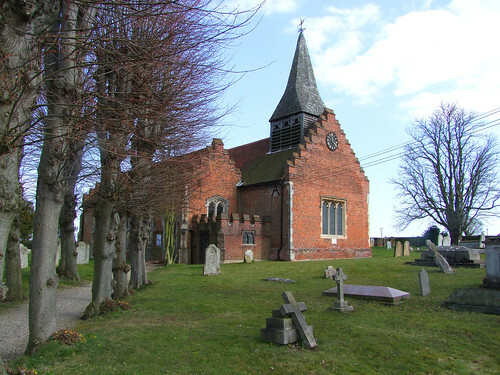 It is the only church in Essex built between the Reformation and the Commonwealth, and looks entirely Tudor late gothic, as if it was a bit fallen off a Cambridge college. Entirely red-brick, both ends have crow-stepped gables, although unfortunately a stupid north aisle was added by that local vandal Chancellor in the 1860s. Finding it locked was annoying as I shall have to go back.